The Legend of Zelda: Ocarina of Time came out in 1998. For a certain generation, it represents the peak of electronic entertainment. Link could climb, swim, and swing his sword like never before. It shouldn’t be surprising, then, that decades later people are remixing and augmenting the game that defined their childhood in music. Zeldawave is an EP that remixes sounds and sights from Ocarina of Time into a trippy blur of gaming nostalgia. Created by Graeme Clarke under the alias Marble Pawns, it’s one of the most polished examples of the extremely niche sub-genre of vaporwave from which it borrows its name. Like Simpsonswave or other offshoots, Zeldawave has the audio distortion, jumbled scanline effects, and slow, methodical beats that make up the genre. The culmination of all of these things is a version of Ocarina of Time that most closely approximates what it would be like to remember having once played it in a dream. Koji Kondo, who composed the music for several Nintendo games, including most of the Zelda series, has said that one of the most challenging things about scoring Ocarina of Time was the jump from the SNES to the N64. The technology’s greater range meant game soundtracks could sound more realistic. “When I was creating the music myself, I had to think, ‘This isn’t going to sound like a computer. This is going to sound like an actual instrument,’” he told USGamer in 2014. Ocarina of Time’s soundtrack isn’t just one of the most memorable of all time, it’s also a unique inflection point in the overall shift from extremely gamey music to more naturalistic scores. For that reason it’s proven a fertile uncanny valley for remixers like Clarke. The same graphical improvements that made Ocarina of Time feel revolutionary at the end of the 90s but now look garish by modern standards are mirrored in the music. The steel drums in Zora’s Domain sit just on the edge of that divide, clearly artificial but hauntingly believable. Vaporwave is a lot of things (including dead, according to most of the people who originally spurred its creation), but throughout much of it is a pervasive sense of ironic distancing. Those seeking refuge in the aesthetics of yesterday’s shopping malls and their monotonous muzak struggle to embrace the gaudy commercialism and troubling underlying economics. Pushing those ideas and others from the Reagan 80s and Clintonian 90s through a filter of sound distortion and repurposed marketing art is a way to have it both ways. In something like Zeldawave, that duality is less overt. The visual pastiche isn’t meant to guard against succumbing to a predatory marketplace ideology so much as the static, unreflective embrace of whatever stuff people happened to like as kids. 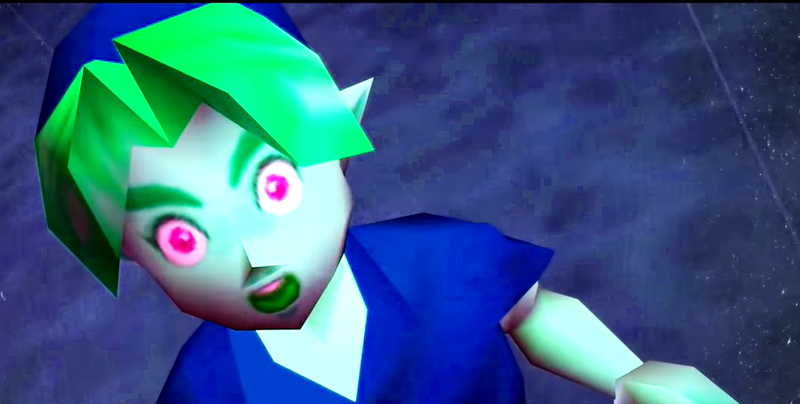 “The Zeldawave videos, along with my other anime/video games/assorted nostalgia based videos, are a way for me to connect back to those experiences, while at the same time reinvigorating them with some ‘added layers’ in the form of trippy visuals and even some newer songs,” said kurodon85, a YouTube curator who mixes old gameplay footage with other popular vaporwave tracks. At the end of the day Zeldawave provides an outlet for those interested in reliving the experience of Zelda in ways that simply playing the games over can’t provide. Similar to visiting your local mall in 2017 (if it even still exists), picking up something like Ocarina of Time or the original Legend of Zelda and playing it today pales in comparison to whenever you first experienced those games. And that’s the largest draw around Zeldawave, or any other nostalgia-driven project. When it works, it provides a window back into the exact moment you first transformed into adult Link or discovered you could burn through bushes to reveal secret dungeons. Even if it only lasts for a few moments in a YouTube video.